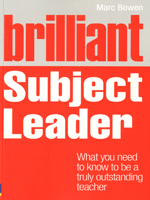 If subject leadership is the next step in your teaching career, look no further than Brilliant Subject Leader. From auditing your subject and curriculum planning to using pupil feedback to improve the teaching of your subject and preparing for an OFSTED inspection, Mark Bowen will equip you with innovative and inspiring ways of leading your subject and reach the next step in your teaching career. Chapter 1: Why become a subject leader?